In 2013, Mike Hudson gave up his job and most of his worldly possessions to build a DIY camper and travel Europe. Today, the 25-year-old is still living out of that van and loving his vagabond lifestyle. Hudson’s dreams of off-grid living and traveling might not be unique, but his dramatic conversion of a rusty van into a cozy, timber-clad mobile cabin is definitely impressive. Click through to see more pictures of Hudson’s home and to explore its space-efficient, off-grid features. Formerly a systems engineer, Hudson quit his job after months of daydreaming about living and traveling out of a DIY camper van. He took the leap in October 2013, and despite not having any prior building experience, successfully converted a 10-year-old rusted LDV van he bought on Ebay into a cozy and self-sufficient timber-clad cabin in a project he calls Van Dog. Topped with 200W of solar panels on the roof, the converted van is fully equipped with running water and electricity to power his shower and tiny kitchen burner and sink. After five months of working on the van, Hudson drove his finished mobile home down south, leaving England to explore other European countries. Hudson uses gas as his main energy source for heating, and stores his gas in an LPG cylinder that can be cheaply refilled at petrol stations. In addition to the pipes he’s routed for the gas and running water, Hudson has also installed a water pump, water heater, and gray water tank. 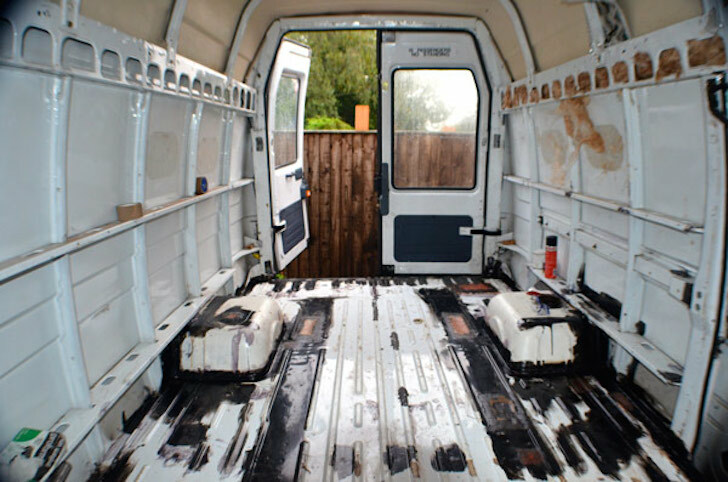 The Van Dog camper van also includes a working toilet, 12V power distribution board with mains hook-up, a compressor fridge/freezer, studio reference speakers, an extendable bed, and storage. Hudson has included some of his DIY guides and blogs about his van adventures on his website Van Dog Traveler. Now we fracking for Water? Because of our Greed fracking for oil contaminated our atmosphere and our entire biosphere. Will our damage to our environment be the death of humanity and our plante????? There's a woman out there, somewhere, who will put an end to this. Enjoy it while you can bro. Had he been really smart, he would have bought a continental van to go travelling on the mainland. The stearing wheel would then have been in the right position. 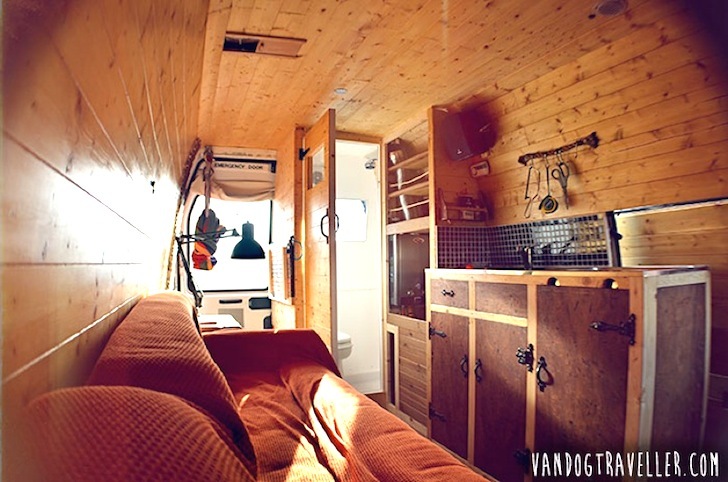 Hudson successfully converted a 10-year-old rusted LDV van he bought on Ebay into a cozy and self-sufficient timber-clad cabin in a project he calls Van Dog. Formerly a systems engineer, Hudson quit his job after months of daydreaming about living and traveling out of a DIY camper van. The van is topped with 200W of solar panels on the roof. The converted van is fully equipped with running water and electricity to power his shower and tiny kitchen burner and sink. After five months of working on the van, Hudson drove his finished mobile home down south, leaving England to explore other European countries. Hudson uses gas as his main energy source for heating, and stores his gas in an LPG cylinder that can be cheaply refilled at petrol stations. In addition to the pipes he’s routed for the gas and running water, Hudson has also installed a water pump, water heater, and gray water tank. His small kitchen area includes a burner, sink, and compressor fridge/freezer. Hudson has also included an extendable bed that fits two. A rear window streams in natural light. The small fold-down work space.